Rihanna recently performed in Baku, Azerbaijan wearing a custom Adam Selman outfit. Her accessories included a large stone ring from Noir and a couple of rings from Jules Smith. One of these was the Chained To You ring, which features two curved gold rings connected by a chain. 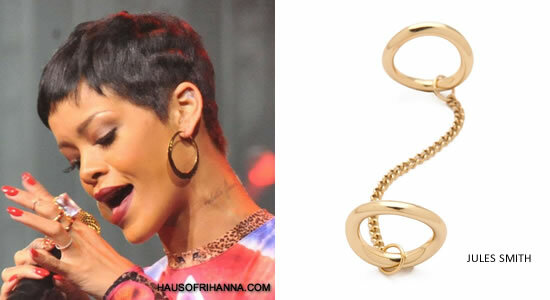 The ring is available at Shopbop or from Jules Smith’s online store for $75.00.